The fast, portable Weldbrush is compact, rugged, acid resistant, and easy to carry. This single unit will clean stainless steel, brass, and bronze, after they have been heat tinted, or TIG, MIG, or Spark welded. The unit can also electro-polish, etch, or brush electro-plate the same metals. 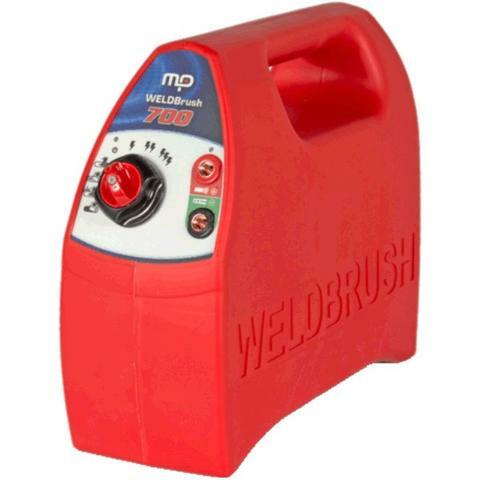 The Weldbrush range covers three different units. The all new powerful WB700 is ideal for the harshest of welds in any situation running at 71A. The WB500 comes complete with enough power to clean MIG, TIG and electrode welds with ease and out performs all its competitors running at 56A, both units also boast the polishing and etching functions. Lastly our entry level machine the WB300 running at 45A makes short work of TIG welds and will also dark mark. All of our units fully passivate the parent material and give a flawless finish every time.